The 2010/11 campaign proved to be one of the most testing of John Maggs’ eleven year tenure. Without a victory in their opening eight games, the Hornets occupied bottom spot at the end of each of the first three months of the season and were seldom out of the bottom four until a remarkable turn around in fortunes saw them put together an eleven match unbeaten run that helped them reach the giddy heights of fourteenth by the first week in January. A cup win over Football League-bound Crawley Town, and successive 3-1 victories over promotion-chasing Kingstonian and champions elect Sutton United, and suddenly it was the play-offs that were being talked about, not the fear of relegation. However, reality returned as we secured just one more league success over the course of the next three months and ended up in a dogfight with a handful of other clubs to avoid demotion to Division One. Thankfully, a late season surge saw Hendon, Wealdstone and Croydon Athletic all defeated to secure our survival by a margin of six points and, although Brighton & Hove Albion and Worthing scuppered our chances of ending the season with some silverware, we could look back with some degree of satisfaction at defying the odds and maintaining our Premier Division status for a sixth consecutive season. Less than a week after the season’s end, it was announced that the club would not be renewing manager John Maggs’ contract due to financial cutbacks, bringing to an end an eleven year association with the Hornets in which he had led them to unparalleled success. After an indifferent pre-season, we welcomed Aveley to Gorings Mead as the campaign began with a home fixture for the first time in fourteen years but a goalless draw meant there would be no dream start for debutants Steve Elliott, Paul Kennett, Jay Lovett and Allan Tait against the 2009/10 losing play-off finalists. Our former skipper, Sam Page, enjoyed a winning reunion with his former team-mates as promotion favourites Sutton United recorded a 2-0 victory at Gander Green Lane but we deserved greater reward when we hosted another much-fancied side the following Saturday. Jay Lovett had the honour of scoring our opening goal of the season and, when Ben Andrews put us 2-1 up against Kingstonian, the scent of a first victory was in the air only for the Ks to draw level and then grab the winner, six seconds from time. A bottom of the table clash awaited us when we visited Tonbridge Angels at the start of September but it was The Blues who were celebrating a first success of the season as we once more failed to find the net in a 2-0 reverse. Hendon were the latest side to profit from Horsham’s defensive uncertainty when Lovett conceded our fourth spot-kick in three games and, although Tait pounced on a goalkeeping mistake to slide home an instant reply, the biggest cheer on a night in which Hendon’s 2-1 win took them to second place in the table came for the returning Gary Charman after a nine month absence through injury. Any hopes that an FA Cup tie at promoted Folkestone Invicta could kick-start our season came to nothing as another poor showing saw us return from Kent on the wrong end of a 4-2 scoreline, with ex-Hornet Simon Austin adding salt to the wounds with a brace of goals. Success of sorts came the following weekend when Folkestone followed us back along the motorway and were grateful to return from Sussex with a point from a goalless draw played out in front of a season’s best 650 crowd, the figures boosted by yet another successful Kids for Free Day. Anthony Storey was recruited from Hastings United and must have wondered what all the fuss was about as he enjoyed instant success with Mark Knee’s wind-assisted free-kick enough to earn us our first victory since mid-April with a win away to Maidstone United. A rare strike from Jack Page got October off to an encouraging start at Billericay Town but another spot-kick saw the hosts draw level before a defensive mishap enabled Danny Charge to send us to our seventh defeat in ten games. Next up it was the division’s least potent strikeforce against the most porous defence and it was a night on which last year’s leading scorer Pat Harding rediscovered his scoring touch with the only goal of the game against Tooting & Mitcham, whose goals against tally now averaged exactly two per game. Signs of recovery had been established, with a healthy seven points from twelve, so it was something of a shock when we travelled to Margate four days later and slumped to a humiliating 6-1 loss. A topsy-turvy fortnight saw Bognor Regis Town, one of the Division One frontrunners, concede four times after the break as we set up a League Cup third round tie with Hastings United, courtesy of a 5-1 thumping of our county neighbours. Further cup success followed when another division One side, Redbridge, were comfortably despatched 3-0 in the FA Trophy but it would be another fortnight before we were back in competitive action again, away to Truro City in the next round of the Trophy. Before that, though, there was a chance for supporters to forget about the struggles of the first team and indulge in an afternoon of nostalgia as players from the recent ‘glory days’ assembled in honour of injured former captain Eddie French as the Supporters Club took on a Hornets Select XI in a hugely entertaining goalfest at Alfold Town. Sadly the long trek to Cornwall proved a disappointing one, City’s task made easier by Knee’s first-half dismissal, although the 2-0 score failed to do justice to Horsham’s valiant display as home ‘keeper Martin Rice put in a man-of-the-match display between the posts for the Southern League big spenders. Just eighty-nine spectators watched Hastings United succeed where Bognor had failed, dumping the Hornets out of the League Cup with a late winner that did little to lift the club’s spirits and there was an inevitability about the 4-0 loss at Lowestoft Town that followed, as another three hundred miles were racked up by the weary players and supporters. Once more it was Tooting & Mitcham who came to Horsham’s aid as the Terrors somehow contrived to turn a 1-0 victory into a 2-1 defeat, conceding twice in an astonishing four minutes of stoppage time, as Horsham moved off the foot of the table. It wasn’t for the want of trying that we failed to fight our way out of the bottom three after Billericay Town’s rather fortuitous 2-1 smash-and-grab raid at Gorings Mead, where Michael Hector enjoyed a goal-scoring debut after arriving on loan from Reading, but that was to be the last time that Maggs’ men would suffer the bitter taste of defeat for nearly two months as they embarked on an eleven match unbeaten run. That the upturn in fortunes would begin against Conference high-flyers Crawley Town would be all the sweeter as Maggs’ Indian sign over his former employers continued with a famous 2-0 win that dumped the Reds out of the Senior Cup. Billy Dunn, a recent capture from Sutton United, got his Horsham career off to the perfect start with a stylish finish against Maidstone United but the Stones hit back to take a point, as did Canvey Island for whom Jason Hallett equalised Storey’s seventieth minute free-kick. A second goalless stalemate of the season against Folkestone Invicta kept the run going before a sensational meeting with Hastings United that produced arguably the match of the season. A hat-trick from Gary Charman put us in a seemingly unassailable position only for Hector, Charman and Kennett to see red and it took an heroic rearguard action from the eight men to restrict our hosts to just two goals in reply. Jamie Cade was clearly impressed with what he saw, electing to join the Hornets from the struggling Arrows within a matter of days and his two goals helped us record back-to-back league wins for the first time this season with a 2-1 win over Carshalton Athletic before the wintry conditions took hold, putting paid to scheduled – and potentially winnable – matches against Cray Wanderers, Hassocks and Croydon Athletic. The New Year fixtures threw up a testing schedule, starting with a trip to the Kingsmeadow to take on fourth-placed Kingstonian without six first team regulars. Led by stand-in captain Storey, and assisted in no small part by the excellent makeshift central defensive partnership of Jahmahl King and Hassan Nyang, the Hornets defied the odds to record a fabulous 3-1 win. Andrews and Hector were back for the visit of Sutton United and the league leaders were no match for resurgent Horsham who produced perhaps the result of their season with another impressive 3-1 victory, a result that could have been even more emphatic had Storey not seen a late spot-kick saved. It was a confident team that travelled to Hassocks to contest the 3rd round of the Senior Cup and, although they met with spirited resistance from the County Leaguers, the good form was maintained with four more goals to make it fifteen scored in five games. Yet as suddenly, and surprisingly, as the renewed confidence returned then so did it disappear as a 1-0 loss at struggling Aveley heralded a run of seventeen league games in which just one returned a three point haul, sending us plummeting back down the table from the misleading ‘safety’ of mid-table. The lowpoint would come just a few days later when Charman’s sixth minute opener served only to awaken our perennial bogey side Harrow Borough who ran in seven goals to send us crashing to a heaviest home defeat in twenty-seven years. A first ever meeting with Concord Rangers, enjoying life in the Ryman Premier following promotion from Division One, saw us again take the lead only to ship a further three goals while Hector was experiencing a loan-spell to forget after collecting his third red card in eleven games. Alan Mansfield was brought back after three years in the Worthing/Whitehawk wilderness and his return reaped immediate – if brief – rewards as the side ended the month with a shock 2-0 success at AFC Hornchurch. The elements came to our rescue when thick fog curtailed our home match against Croydon Athletic, with the crisis-hit South Londoners deservedly leading 2-0, and the players would have been grateful for similar cover at the end of the return trip to Harrow Borough but there was no hiding place as they trooped off the Earlsmead pitch smarting after a 6-0 drubbing. Little wonder that a season’s lowest attendance of just one hundred and forty four gathered for the midweek visit of Cray Wanderers and there was no reward for the hardy faithful as the Kent club sauntered to a 4-0 victory, despite the setback of starting the match with only ten men after the late arrival of goalkeeper Dave King. The injuries were beginning to mount up and Andrews joined long term casualty Cade on the sidelines after damaging his knee in an otherwise encouraging 1-1 draw with Margate. Maggs drafted in Williams Peauroux from Lewes for the long midweek trek to Bury Town, but he was unable to prevent another defeat although it was an improved display from the understrength Hornets. With a dismal ‘goals for’ tally of twenty-eight in twenty-nine games, there was little surprise that we drew another blank at Carshalton Athletic but a shut-out by Mark Zawadski secured a valuable point from a venue that seldom fails to provide a tangible return for the travelling Hornets. In a welcome respite from the pressures of Premier Division survival, we made the journey to Burgess Hill Town where Davies spared our blushes with a stoppage time leveller, and a goal apiece in extra-time meant a replay to decide who would take on Brighton & Hove Albion for a place in the final. But any thoughts of an historic appearance at the Seagulls’ AMEX Stadium had to be put on hold for the first ever visit of Lowestoft Town, who could consider themselves fortune to return to Suffolk with maximum points after what Maggs described as his side’s best performance of the season. March began with another extra-time cup tie, with penalty-kicks needed by a much changed Horsham side to see off the challenge of lowly Peacehaven & Telscombe in the Brighton Charity Cup. Any hopes that this rare victory would inspire the side to a similar achievement at Canvey Island proved unfounded though with Cade’s goal, in his first appearance in seven games, the sole highlight of a 3-1 loss. The former Hastings and Tonbridge man struck again, in the re-arranged match with Croydon Athletic, but the Rams hit back to share the points and Horsham’s luck was out when they hosted Bury Town whose march towards the play-offs continued with a flattering 4-1 scoreline. Ringmer provided the opposition as new boy Ashley-Paul Robinson got off the mark in a 3-1 win to help us progress to the Brighton Charity Cup semi-finals and sparked one final flurry of results that, ultimately, secured our Ryman Premier Division survival. Storey’s late penalty gained a partial restoration of pride against Cray Wanderers, with a 1-1 draw at Hayes Road, and Burgess Hill offered surprisingly little as they exited the Senior Cup via a 3-1 margin before the anticipated rematch with Hastings United. Seen as a ‘must-not-lose’ meeting between two relegation threatened sides, Robinson punished his former team-mates with an early goal only for Andrews to mark his overdue return from injury by picking up two yellow cards and a fourth dismissal for the Hornets in two games against their county rivals. 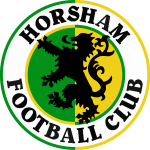 Unable to cope with their numerical disadvantage, Horsham conceded the inevitable equaliser and were grateful to take a point that kept them above Hastings in seventeenth place. A third successive league draw, while showing some welcome consistency, did little to calm the nerves as AFC Hornchurch saw a number of strong penalty appeals go unrewarded but Hastings’ 3-0 win over Margate, and our own 2-0 defeat at Concord Rangers, saw us drop a place while our 8th sending-off of the season meant that we would be without the services of Storey for the crucial Easter programme. Survive or not, we did at least have a cup final appearance to look forward to after ‘Horsham new’ saw off the challenge of ‘Horsham old’ as Three Bridges, Carney, Howard, Brake, Death et al were beaten surprisingly comfortably in the Brighton Charity Cup meeting at the Jubilee Field. Now when Horsham are desperate for points there are a number of places they would rather not visit. Harrow’s Earlsmead for one, maybe Tonbridge Angels another, but with no Horsham side ever having won away to Hendon it was a journey tinged with trepidation as the Hornets made the journey to Wembley for the early afternoon kick-off. But they needn’t have worried. Under the guidance of captain-for-the-day Charman on his five hundredth appearance, and with the backing of several hundred Manchester City fans in the area for their FA Cup semi-final tie with their red-shirted city rivals, the Hornets turned in their biggest league win of the season with the 3-0 result taking them back above Hastings. With Folkestone’s return to Division One already confirmed, and Croydon Athletic needing a mathematical miracle to escape the drop, four teams would battle to avoid filling the the remaining two relegation places over the final three matches; Horsham, Hastings, Aveley and Maidstone United. Wealdstone arrived at Gorings Mead with nothing to play for. Resigned to a twelfth placed finish, regardless of all other results, the visitors offered little to excite their followers with Peter Dean’s scrappy eighty-ninth minute goal serving only to provide a late scare for the Hornets for whom goals from the two Jamies, Cade and Brotherton, secured back-to-back wins for the first time since January. With just a solitary point required from the Easter Monday meeting with doomed Croydon Athletic, and Hastings and Aveley due to meet on the final weekend of the season, the heat was off somewhat although the absence of Andrews, Charman, Storey, Kennett and Woodford gave the side a rather weakened look. And when Tommy Whitnell and Stefan Rasmussen gave the Rams a half-time lead, it began to look as though our survival would come down to the final match of the season. But, with Croydon displaying all the characteristics of a relegated side, we hit back with three unanswered goals after the break and could even afford to give goalkeeping coach Rob Frankland a cameo outfield appearance as we celebrated our escape with an entertaining 4-2 win. Job done, there was still the small matter of a Senior Cup semi-final with Brighton & Hove Albion but there was to be no fairytale ending to the campaign as the Seagulls set up a final tie with Eastbourne Borough, courtesy of a 2-0 win. The scoreline was repeated amid celebratory scenes at Gorings Mead where Tonbridge Angels’ travelling hordes cheered their side’s achievement in securing their promotion play-off spot as the curtain came down on the 2010/11 campaign. A long and testing season was concluded at Worthing where Steve Metcalf’s late header saw the hosts take the Brighton Charity Cup in a disappointing final.